Living with flood risk is still the common condition of most European cities, from Alpine valleys to coastal deltas. However, how we conceive of disaster and the means to protect ourselves have both evolved radically, through centuries of extensive reclamation and channeling that have made floods less likely to happen, but have also made them more abstract and potentially more devastating. 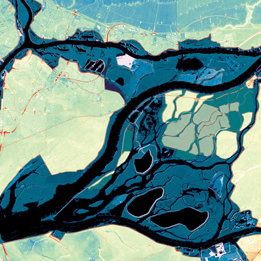 Following centuries of deluge angst and blinding Technicism, current adaptation projects bring about a new perspective that reintegrates flooding into spatial perception and territorial design. As a consequence, water management is evolving from a long-reserved technical domain towards a wider territorial issue involving cultural, economic, and ecological dimensions, one which calls for interdisciplinary answers. From ancient adaptation mores to current horizontal strategies , from deluge tales to climate change anxiety, from Promethean technicism to the hopes of a restored harmony, the history of flood reflects an ever-changing relation to nature and uncertainty, which in return influence our capacity to act and react to the challenges posed by environmental fluctuations. River widening, ‘renaturation’ or controlled flooding increasingly replace or complement traditional containment infrastructure. They bring about a new perspective that reintegrates flooding into spatial perception and territorial design, but also give rise to new myths that challenge the ethics of landscape architects. These new practices in the architecture of flood-prone landscapes are analyzed through five key projects located in Switzerland, Germany, France and the Netherlands. 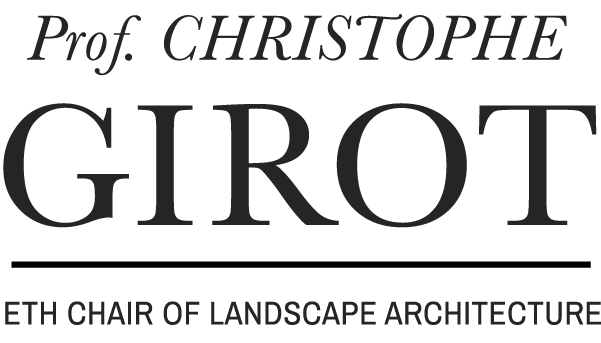 A ‘research by design’ follows two previous design studios conducted at the ETH Zurich by Professor Christophe Girot and Frédéric Rossano, at both ends of the flood problematic: along the Rhône in Sion (Switzerland) and in the Rhine-Meuse Estuary in Dordrecht (the Netherlands). Tools and methods are developed through geographic analytics and prospective scenarios involving landscape, urban, and river transformation at these two sites, supported by historical material, digital terrain data and combined computational tools. The investigation will eventually lead to a conceptual reflection on contemporary designers’ positions on nature and flood risk, and develop the tools, methods, and concepts needed for the strategic choices that will have to be made to keep Swiss and other European cities both safe and attractive by the creation of flexible and resilient landscapes. Preliminary results have been presented by Frédéric Rossano at the Swiss Federal Institutes of Zurich and Lausanne and at the Ecole Nationale du Paysage, Marseille; an article based on this research was recently published in the Journal of Landscape Architecture: From absolute protection to controlled disaster: New perspectives on flood management in times of climate change.